This is a page of supplemental information in regards to the arcade game Home Run Derby. This page was done due to the fact it was the first coin-op game to utilize 3Dfx hardware, hence makes a nice little addition to the site. The only picture I can find of Home Run Derby- It was on a Japanese business website that sells video games! I have requested a better picture of the machine if possible and will post it of course. ELECTRONIC ENTERTAINMENT EXPO (E3), Los Angeles, California, May 16, 1996 -- 3Dfx Interactive, a company focused solely on bringing the next generation of interactive 3D technology to the electronic entertainment industry, today announced the first coin-op game that runs on its 3D graphics chipset, Voodoo Graphics™. Home Run Derby, developed by Interactive Light, Inc., is the first sports game that displays photo realistic, real-time, 3D graphics, allowing a player to swing a real bat at a virtual baseball. The game will be shown during the Electronic Entertainment Expo (E3) May 16-18 at 3Dfx Interactive's "campground" and Interactive Light's booth #4325. The campground will be located at 12th and Figueroa Streets in front of the North Hall of the Los Angeles Convention Center. "For the first time, baseball fans can truly submerge themselves in a 3D ballpark adventure," said Kristin Montgomery, entertainment market sales manager for 3Dfx Interactive. "This is just the beginning of what gamers will experience when playing a game at home or at the arcade that is developed using Voodoo Graphics." To play Home Run Derby, the batter enters a batting cage and stands at 'home plate' in front of a big screen monitor, awaiting a pitch. A 3D ball is then hurled towards the batter. As it nears home plate, the batter swings. Interactive Light's proprietary infrared sensors instantly measure the batter's timing to determine speed, angle and orientation. These measurements determine the direction of the ball, and whether or not it will be a home run. The "camera" follows the ball into the field on a hit or into the crowd on a home run. All facets of the baseball hitting experience are included from the type of pitch to the timing, locations, speed and motion of the swing. "We're very excited to utilize the Voodoo Graphics card because it now makes the visuals as real as the rest of the overall experience," said Stuart Wallock, director of marketing, Interactive Light. "Our sports simulator technology allows a batter, for the first time, to swing a real bat without any tethered wires or internal electronics. Everything from the 'crack' of the bat connecting with the ball to the cheers of the crowd are so real that they bring us back to those summer afternoon ballgames." Interactive Light's software subsidiary, Immersia, developed Home Run Derby for both the Sony PlayStation and PC/3Dfx platforms. Immersia's chief executive officer, Joseph Deutsch said that "his design team was extremely pleased with the power of the Voodoo Graphics board and the overall support of the 3Dfx team -- the design possibilities of this system are amazing." 3Dfx Interactive introduced Voodoo Graphics last November. With texture-mapped graphics performance exceeding one million triangles per second, Voodoo Graphics enables a new class of photo-realistic and highly interactive 3D games. Voodoo Graphics offers advanced capabilities and performance well beyond the elementary 3D technology found in commodity Windows and multimedia accelerators. Voodoo Graphics' advanced features dramatically enhance visual quality and accuracy without sacrificing performance. Voodoo Graphics extends beyond 3D rendering to include radical special effects that create a truly unique gaming experience. Interactive Light, located in Santa Monica, California, founded in 1989, also markets a line of interactive music devices as well as several safety and communication products that rely on the same patented infrared sensor technology. The Dimension Beam™, for example, the primary product in the music line, is the first musical input device ever available that can turn a performer's body into an instrument. And with or without an instrument, choreographed motions allow a performer to dance on stage while also creating music, sound and visual effects. 3Dfx Interactive, Inc., founded in 1994, is a privately held company headquartered in Mountain View, California. The company has brought together a team of leading professionals from the PC, video game, semiconductor and 3D graphics industries to provide new levels of interactive 3D electronic entertainment. Until recently, coin-op games used dedicated hardware and enabling technology to create the most immersive games. These games used high-end graphics, sound, and often exotic input devices. Recently the personal computer, with its increasingly powerful processors, accelerated 3D graphics, and high-end sound capabilities has become an alternative game platform for coin-op. Immersia Ltd., a subsidiary of Interactive Light, started developing PC-based coin-op games about two years ago. Immersia's Real Sports Simulation line of products is based on Interactive Light's proprietary Smart Beam technology, which enables players to play different types of sports games with the actual sports equipment used in the real game. Immersia's first product, the POWER HOME RUN DERBY baseball simulator, enables the player to swing a real baseball bat to hit a virtual pitched ball. It was completed in June 1996 and is now installed in more than 500 locations around the country and in some locations outside the U.S. In the beginning of 1997, Immersia introduced the first software upgrade package for POWER HOME RUN DERBY, called PITCHER'S DUEL TOURNAMENT EDITION. This upgrade was mailed to location operators in the form of a CD-ROM and floppy disk package. It was the first time operators were able to enhance their game by installing new software instead of replacing dedicated hardware. There are a number of reasons why the PC is an excellent platform for coin-op. First and most important to us as software developers is the fact that the PC, specifically the machine defined by Intel's Open Arcade Architecture (OAA), is a well-defined standard, as opposed to the dedicated electronic game board, found in many arcade games today. Immersia started developing PC coin-op games almost two years ago, long before the OAA initiative was established. At that time, we identified the strong capabilities of the PC as the platform for our coin-op titles. Furthermore, we felt that we would benefit from the special capabilities that the present OAA PC offers, such as the ability to upgrade the game via a floppy disk or CD-ROM, to insert ads, and to customize our game for certain locations or special events, such as holidays or game tournaments. Targeting the PC platform for our arcade title let us easily staff our company with experienced PC software engineers to create our games in a cost-effective manner. It also enabled the use of state-of-the-art development tools, including compilers, debuggers, and version control systems. The OAA PC also allowed us to develop a number of infrastructure software modules, such as the arcade operator (which controls the game settings and allows adjustments to be made in the arcade), the attract mode (which automates the game's attract mode sequence), the game peripheral control (which controls the special arcade peripherals used in the game), to accomplish arcade-specific tasks. These infrastructure modules, combined with our object-oriented design and implementation methodologies, are now packaged as an in-house toolkit that we use over and over again in all of our titles. By continually evolving our toolkit, we can easily boost the performance of our games in a very cost-effective manner. ELECTRONIC ENTERTAINMENT EXPO (E3), LOS ANGELES Los Angeles city (1990 pop. 3,485,398), seat of Los Angeles co., S Calif.; inc. 1850. ..... Click the link for more information., May 16 /PRNewswire/ -- Interactive Light, Inc., a leading electronic entertainment developer, today launched its HOME RUN DERBY This is about the Major League Baseball contest. For the 1959 television show of the same name, see Home Run Derby (TV series). The Home Run Derby is an event played prior to the Major League Baseball All-Star Game. ..... Click the link for more information. 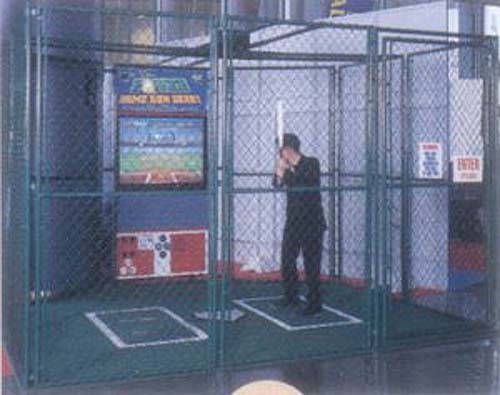 coin-operated game, the first baseball simulator that allows a player to swing a real bat at a virtual ball. Home Run Derby is also the first sports game that displays photo realistic, real-time, 3-D graphics, and it is the first coin-op game that runs on 3Dfx Interactive s Voodoo Graphics (TM) 3-D accelerator card. The game will be shown during the Electronic Entertainment Expo (E3) May 16-18 at Interactive Light s booth (# 4325 West Hall) and at 3Dfx s "campground," located at 12th and Figueroa Streets in front of the North Hall of the Los Angeles Convention Center The Los Angeles Convention Center (abbreviated LACC) is a convention center in downtown Los Angeles. The LACC hosts annual events such as the Greater Los Angeles Auto Show, and was best known to video games fans as host to E3 until its cessation in 2006. The officer of a firm responsible for day-to-day management, usually the president or an executive vice-president. said, "never before has a game captured the essence of the great American pastime so well. The game recreates the experience of batting against real pitchers. All facets of the baseball hitting experience are included, from type of pitch ... fastball, slider A block of material that holds the read/write head of a magnetic disk. See flying head. , change-up, or curve ball, pitch locations and velocity, to the timing, locations, speed and motion of the swing." Interactive Light s director of marketing, Stuart Wallock, said "our sports simulator technology allows a batter, for the first time, to swing a REAL bat, without any tethered wires or internal electronics this makes the player feel like he is actually at the plate. The sound effects are also realistic. Everything from the crack of the bat connecting with the ball to the cheers of the crowd are so real that they bring us all back to those summer afternoon ballgames." He added, "we're very excited to utilize the Voodoo Graphics(TM) card because it now makes the visuals as real as the rest of the overall experience." Interactive Light is planning to release boxing, golf and other sport simulators utilizing the same core infrared sensor technology and 3Dfx graphic system. Wallock added, "we will initially launch our games to the coin-op market and then follow up with consumer versions of the sensor technology and software." A May 1996 article in Replay magazine, an industry trade journal, titled "IT S A HIT", announced that Interactive Light with the assistance of Betson, completed a distribution agreement that gives Innovative Concepts in Entertainment ("I.C.E.") the rights to market HOME RUN DERBY on a worldwide basis. Betson is the largest distributor of coin-op equipment in the U.S. I.C.E. is the maker of Cyclone, the leading redemption game for the coin- op market. I.C.E. s chief executive officer, Ralph Coppola, said that "HOME RUN DERBY could be the greatest sports simulator ever brought to the market -- the game play is so close to reality that one actually feels like they are hitting a baseball into the stands of their favorite stadium." 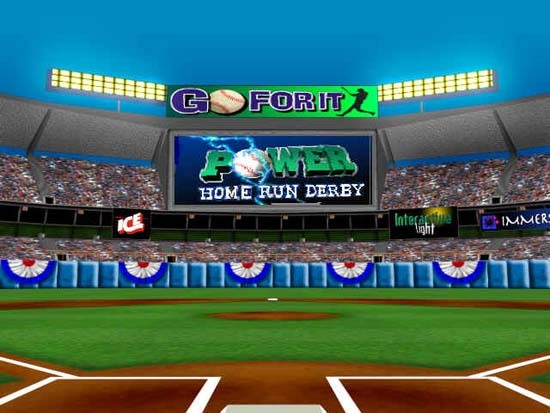 Interactive Light's software subsidiary, Immersia, located in Israel, developed HOME RUN DERBY for two platforms, the PC/3Dfx and the Sony PlayStation. Immersia s team is composed of highly experienced simulation developers. Immersia s chief executive officer, Joseph Deutsch said that "his developers were extremely pleased with the power of the Voodoo Graphics (TM) board and the overall support of the 3Dfx team -- the design possibilities of this system are amazing." Deutsch added that "the people at Sony and the PlayStation platform allowed Immersia to build a highly interactive, visual game." Another subsidiary of Interactive Light, 3Name3D, which specializes in the development of custom 3-D models for the entertainment industry, assisted in the development of the game. 3Name3D is considered a leader in the development of VRML (Virtual Reality Modeling Language) A 3D graphics language used on the Web. After downloading a VRML page, its contents can be viewed, rotated and manipulated. Simulated rooms can be "walked into." The VRML viewer is launched from within the Web browser. web pages and provides models to Digital Domain, IBM (International Business Machines Corporation, Armonk, NY, www.ibm.com) The world's largest computer company. IBM's product lines include the S/390 mainframes (zSeries), AS/400 midrange business systems (iSeries), RS/6000 workstations and servers (pSeries), Intel-based servers (xSeries) , Interplay, MGM Interactive, Microsoft, NBC NBC in full National Broadcasting Co.
Major U.S. commercial broadcasting company. It was formed in 1926 by RCA Corp., General Electric Co. (GE), and Westinghouse and was the first U.S. company to operate a broadcast network. , Sega, Time Warner, and many others. Separately, Interactive Light s chief executive officer, Amir Rubin, announced that Jeff Walker, a 14-year veteran of the electronic entertainment industry, has joined the company as its chief operating officer. Mr. Walker has held various sales, marketing and product development positions at Nintendo and Capcom. Interactive Light, located in Santa Monica, California, founded in 1989, also markets a line of interactive music devices as well as several safety and communication products that rely on the same patented infrared sensor technology. The Dimension Beam(TM), for example, the primary product in the music line, is the first musical input device ever available that can turn a performer's body into an instrument. And with or without an instrument, choreographed motions allow a performer to dance on stage while also creating music, sound and visual effects. "The Dimension Beam(TM) captures spontaneous expression. It opens a whole new world of composing using free body movement," said John Laraio, who has been creating innovative ways to translate motion into music with the Dimension Beam(TM) and will be demonstrating some of his compositions at the MGM Interactive booth at E3 (# 1525 West Hall). John Laraio has toured and performed with John Anderson and the band Yes. John is currently composing music for films and interactive games and has composed the music for a demo of "The Outer Limits Online: Beyond Resurrection" game for MGM Interactive, which will be shown at E3. Peter Gabriel said "I was excited to discover the beam and hear the range of sounds it produced. I think there is some magic in this instrument." Trevor Rabin said the Dimension Beam(TM) "allows for a new writing expression previously unknown." And Jonathan "Sugarfoot" Moffet said, "I can see the next generation of live entertaining in the Dimension Beam (TM) -- where choreography meets sound, where the physical generates the audible ... Its only weakness is in the limits of your imagination." 3Dfx Interactive, Inc. of Mountain View, California For the census-designated place, see Mountain View, Contra Costa County, California. For other places called "Mountain View", see . Mountain View is a city in Santa Clara County, in the U.S. state of California. The city gets its name from the views of the Santa Cruz Mountains. ..... Click the link for more information. introduced their Voodoo Graphics (TM) chipset in November 1995. With texture-mapped graphics performance exceeding one million triangles per second, it enables a new class of photo-realistic and highly interactive 3-D games for both coin-op and PC game markets. Voodoo Graphics (TM) offers advanced capabilities and performance well beyond the elementary 3-D technology found in commodity Windows and multimedia accelerators. Voodoo Graphics(TM)' advanced features dramatically enhance visual quality and accuracy without sacrificing performance. Voodoo Graphics (TM) extends beyond 3-D rendering to include radical special effects that create truly unique gaming experiences. For more company information, contact Stuart Wallock at Interactive Light at 800-213-3752 or by fax at 310-452-7443 or by e-mail at Stuart@ywd.com.